I feel like the closer I get to my due date with baby #2, the harder it is to get posts written. Life has been busy to say the least especially with an active two and a half year old son. During the daytime, I’m busy keeping him entertained. During nap time and evenings, I’m busy keeping things running at home and preparing for the baby…oh yeah, and some relaxing and sleeping. That said, here I am! And I today is about a new indoor play space. I’ve been meaning to check out Pump It Up for a long time and I finally got there on Wednesday. Sometimes I get stuck into my routine or set places, and I also get a bit of anxiety when I don’t know anyone that’s gone or know what it’s like. But I gathered up my mama courage and headed over there in hopes of getting some Caleb wiggles out. And my hopes came true: wiggles were definitely gotten out. Caleb LOVED it. I thought he might be more timid, but he dived right into the fun (quite literally). Basically, the place is made up of a bunch of big bouncy house type features. They are all different and they were in pretty decent condition. Our friend that was with us mentioned it was in better shape than WiggleWorks in Puyallup. I haven’t been there, but he is a trustworthy source. I don’t know how often they clean, but it was reasonable in my book. I didn’t feel like it was dusty or sticky, but you probably want to wash your hands afterwards. ;) For our visit, we experienced two rooms: Arena A and B. We started in Arena A where there were four large bouncy features. Bouncy Feature 1: Climb up a laddered slope to the top, and then drop down into the bouncy yellow area. Then you crawl off. Bouncy Feature 2: A round bouncy area with a half moon in the center you can climb on. There is netting all around it to keep the kids inside. Bouncy Feature 3: Climb a laddered slop tot he top, and then go down the big slide. Bouncy Feature 4: Climb onto a block type cushion, then you can try to jump onto the purple balls or jump around the open bounce area. On the other side is a block cushion and a small slide to get off. Also in Arena A was some big blocks to build a track type thing, or railroad according to the kids. There were some arcade games and an air hockey table. Oh, and two massage chairs, I guess if you have older kids you might have a moment to relax…maybe? Arena B was harder to capture photos since it was dimmer lighting. There were three more bouncy features, a floor light thing that flashed different designs, and some more arcade driving games. Floor Lighting Feature: I think it shows different patterns and designs. When we first arrived, it showed popcorn kernels and when you stepped on them, it turned to popped popcorn. I am unsure if you had to turn this on or pay for it because it didn’t keep going while we were there (comment below if you know!). The popcorn thing was pretty cool while it lasted, though. Bouncy Feature 5: Sorry no photo! This one was too hard for our little 2-1/2 year olds, so we didn’t play on it much. It was half cone shaped with holes for hands and feet. It was acting like a rock climbing wall. Fun probably for just a bit older kids. Bouncy Feature 6: There was a main jumping area, but with some obstacles that were horizontal logs. You could also climb up and go down a medium slide slide on the side. The photo is crumby, sorry, but maybe it gives a small idea of what it was like. Bouncy Feature 7: This was a mega bouncy feature. There are two slides on both slides of the feature. You go through some push bag type pillars in the center and then you have a basically a rock climbing wall. 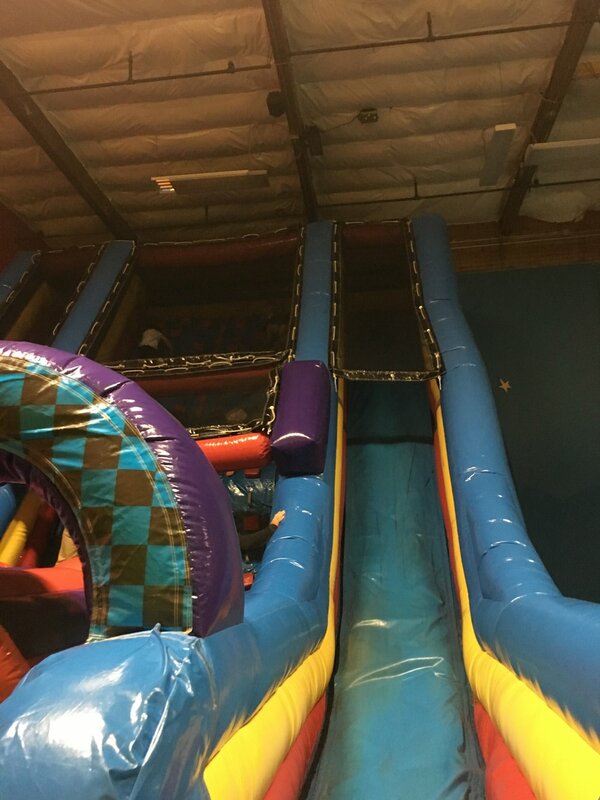 You climb the wall and then can slide down on either end. I didn’t think Caleb could do it, but after a few attempts he was able to climb up. Once he knew he could do it, he kept going again…and again…and again. Our friend needed a boost, but he was able to do it as well. There is a calendar on their website, but it looks like it has “Open Jump” every weekday morning. For “Open Jump” it was $6 per child 4 year and under, or $8 per child over 5 years. I also just happened upon this Groupon for two open jump passes for $10.50. Definitely yes. 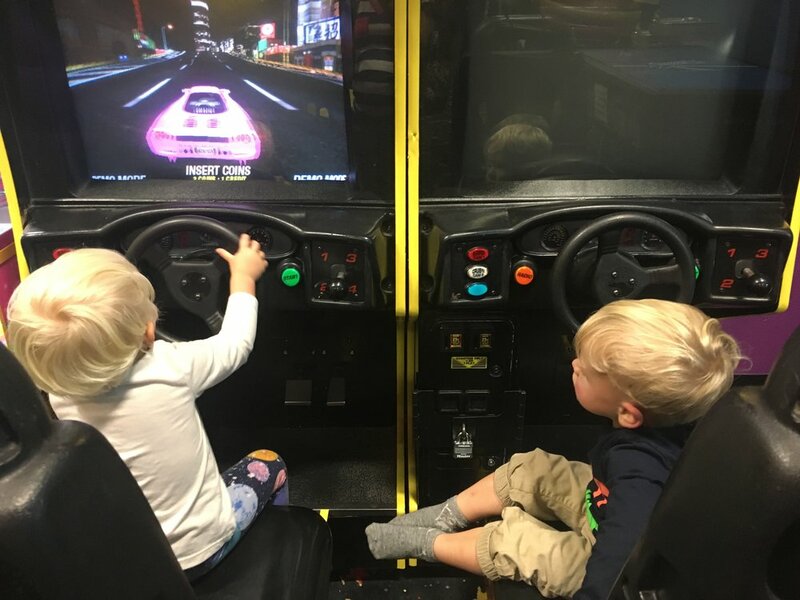 Caleb and his friend had a blast and this will be perfect with the coming rainy season. Have you gone? Did you like it?